Generally, growlers are used to transport beer from bars/brewery to the comfort of your home. The stainless steel growlers, however, have really taken the heights to another level. Not only can you have your favorite beverages in your home but also outside in your different endeavors and adventures. The growlers are flexible in use and even outperform some thermos flasks. They can be used to keep your favorite beverage fresh hot or cold anytime. A comparison of glass and ceramic growlers shows the stainless steel reins superior overall. Despite this, choosing the best for you can be hard. In this article, we shall go through the best of them that you can find in the market at ease. Hope you find one to add to your must-have list in your next shopping. The purpose of a growler is to store as much beer as possible. Therefore a large container that can hold a few cans of beer would be perfect. A small container would be of no use since it defeats the purpose of having a growler. The material should be mostly shock and impact resistance to avoid breakage. Stainless steel offers the best type of material for all type of growlers. They are bound to fall or be dropped a lot. Stainless steel growlers are by far much better than glass or ceramic growlers and last longer. This is how it is made. An insulated growler is much better than one which is not. Insulation is enabled by construction doubled walled bottle. This helps keep the beverages inside at your preferred temperature. The lid should be designed to keep away unwanted stuff from entering inside as well as leaking. Furthermore, it should cover in the carbonation as well as protection from unwanted bacteria. This guarantees your beverages of freshness. This is basically the wow factor of the growler. The color, shape, and size should be attractive as well as fits your personality as well as lifestyle. You should feel comfortable with it. It should also be easy handle, probably has a strap for easy carriage in your adventures. 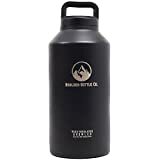 Boulder Bottle Co. has the honors of kicking off this interesting list of stainless steel growlers. The quality is impressive, made from the 18/8 stainless steel with a powder finish. You can be guaranteed that with even minimal care this bottle might last your whole life. It has enough capacity to hold a 6 pack volume worth of beer. With such capacity, you can enjoy the rest of the day at the beach. No more hassle trips to get yourself a drink. The growler is flexible and can store your various drinks apart from beer. 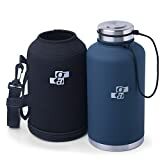 It keeps your cold drinks cold and hot ones hot. For this reason, you can use it in in any season. Coffee stays hot up to 12 hours; you can now have that long study night hours. The growler is lightweight and offers a great grip hence easy to carry. Wide mouth feature enables you to have your drink comfortably. As well helps for that simple and careful cleaning. The manufacturer boasts of an amazing customer service. They modified the seal at the lid due to customer suggestions in order to better this already satisfactory product; Henceforth, the items in your bag as safe, no more spills. It seems the Growlerwerks motto craft, innovation and ease have paid off. Unique in style, perfect in function this is the probably the best beer growler. Perfect for that occasion with your friends or family and it doesn’t matter where. They will probably ask you where they can find one. Anytime is beer time and this fine growler keeps it fresh and carbonated for 2 weeks. Installed with a custom dispensing tap, you can effortlessly pour the beer without removing its lid. This helps since the continuous opening of the cap decreases carbonation. Besides, a regulator cap and its VPR technology help automatically maintain the carbonation. Its double-walled steel provides a vacuum insulation that helps in temperature regulation. Your cold beer stays cold all day. Steel is also durable, hence get one of this long-serving growler for you and yours. Stainless steel growler from Bottle Bud fights its way into the list. The double wall enables a vacuum insulation that helps in preserving your beverage temperature. The two layers help keep your tea hot through the day. Moreover, your cold drinks stay cold least 24 hours even in hot environs. The growler is flexible you can carry a different variety of drinks with it. Has no liners, the drink is in contact with the stainless steel. This ensures that your beverage stays fresh as poured in. it also protects your beer from harmful UV light ensuring your beer tastes exactly as is should. The mouth is wide with an easy pour. It enables you to have an easy cleaning time. A metal lid covers the top; constructed with silicone it forms a great seal. Throw it in your bag and get going, fret not of spilling to other items inside the bag. Little details matter TWO EXTRA SILICONE LID SEALS. UPDATE: We listen to our customers, which is why our newest batch of inventory has included updates to the threading on the lid to prevent accidental spills. Craftsmanship by Prokeg sets a bar higher than normal growlers. This growler has a nice admirable beautiful look. Of course, the stainless steel is high quality but single walled. This ensures that you can afford a growler with the same functions as any other. Also makes it light in weight you can comfortably carry it. The lid is sophisticatedly designed forming a flip type of lock system. In addition, a silicon gasket is installed at the mouth hence preserving carbonation up to 2 days. Apart from beer, you can store your favorite drink and any other beverage. Stainless steel doesn’t corrode with drinks hence perfect for your drink storage. 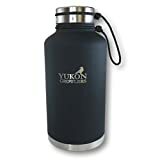 The Yukon Growler has adventure written all over it. This Canadian designed growler boasts of a sturdy construction. Double walled forming a vacuum insulation in between helping with maintaining the temperature of your drink. In addition, it comes with a neoprene insulated sleeve that acts like a jacket. The case makes it easier to carry. Long walks in the snow and your water will be as hot/ warm you left the house. Lid contains a silicone gasket that prevents leaks. You can shove it in your bag and no spillage to other items inside. Strong threads make up a leak-proof seal that ensures your refreshment stays inside. Condensation collection is also prevented by the leak-proof lid. Holding more than 5 cans of your favorite drink; this generously sized holds enough for that afternoon at the beach. Comes with free stainless steel glasses of lesser volume and stackable. Besides, it’s awesome for your camping adventures or simple home use. No liners drink is contact with steel ensuring no leaching with chemicals. Therefore ensuring your drink is fresh tasting. Has a government warning and size of the growler at the base. This ensures that you can be served at any brewer nationwide with that bottle. Midway through and this 1.9-liter beer growler by G Francis surely deserves a mention. It has a simple and elegant design to it. Single-walled high-quality stainless steel construction. Has no liners thus keeps your beer fresh all day. Not only for carrying beer but you can use it for your other favorite drinks. It is more efficient than carrying a soft cooler for your daily activities. Light in weight and holds a large volume for a normal consumption. Reduces the trips hassle to the drink stall for that sold out concert. Temperature is preserved for longer periods thus keep your beverage cold longer. The 1.1 pounds bottle is easy to carry helped by a carrying handle that folds when not in use. The top has an airtight seal feature that helps in preserving your drink as it was poured in. As well as ensuring an easy and secure close. Lid top is attached to the bottle. Yukon Growlers are known for their quality products. Just like its brother, the construction is sturdy. Double walled insulation for preserving the temperature of your beverage. It comes with a black neoprene insulation jacket that helps to keep your drinks cold. Ready yourself for cold brews at that football game, the park, and campsite. Generously sized this bottle can comfortably hold six 6 pack cans of beer. A day at the beach and you won’t be making trips to the brewers’ stall. Installed with a carry handle makes it easy to carry with you. Also, comes with a carry bag with adjustable straps that makes it convenient. Besides, it has a weighted balance that makes it effortless for carriage. The manufacturer added four-pint glasses from which you can drink from. These stainless steel glasses compliment the growler. Moreover, experience risk-free purchase for the awesome lifetime warranty offered. 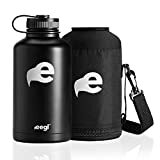 A podium finishes for this growler by Eegl. Making it halfway through is not easy. Yet this state of the art constructed growler deserves its position. The stainless steel quality is great as advertised. Vacuum insulation from the double wall feature ensures your cold beverage stays cold as well as hot remains hot. Resistant to impact you can rest assured of continued functionality even after accidental drops. As well, rustproof hence that lifetime service. 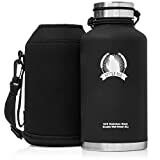 With a large holding volume, you can take this growler to your workouts and games as a water jug. It is toxin-free and thus no leaching with chemicals, therefore, maintains the integrity of your drink. Powder coat finish on the outside makes it sweat proof and prevents condensation collection. It comes with a carrying pouch makes it easy to carry. You can adjust the shoulder straps to your convenience and comfortability while carrying. Furthermore, the company offers gifts for 5-year guarantee investment in Eegl growler. Savor your beer with this top of the line growler from 45 Degrees Latitude. Constructed with a vacuum insulation this ensures your beverage integrity is maintained for several hours. Carry your picnic tea and it will keep it hot throughout the day. It is generously sized holding nearly 2 liters of your favorite drink. With this, you can keep yourself hydrated all through that football practice. Personalize it with one of six bands that come with it for that extra fun. Price is friendly for such a sturdy growler. Wide mouth for easy out drinking and pouring. Also helps for stress-free and effortless cleaning. Stainless steel ensures that bruises, bumps, and drops won’t affect its function. The powder coat finish gives the growler a fine grip and guarantees that no condensation at the growler sidewalls. 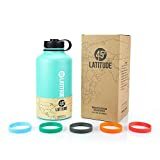 Get your one of this great bottle and see yourself save money and time. A 5-star growler from Grocery Art graces us the top position. Simple in construction, doubled walled vacuum insulation offers maximum temperature preservation for longer periods. 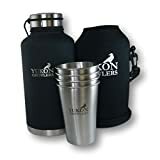 BPA free high-quality stainless steel certifies that your beverage stays as it was poured. Your hot cup of coffee stays hot throughout the day. Keep hydrated in that hot Caribbean beach temperatures. It can keep your colds cold for nearly 3 days. I know camping with it would be something. Nearly 2 liters in volume it a perfect volume to put your several six packs for that football game. The dark coat finish enhances its grip at the same time a smooth feel. The lid is installed with a gasket that safeguards your drink from spilling and leaking. Moreover, you can easily and comfortably carry it with an installed protective carrier. Convenient for anywhere and everywhere you go. Beer storage is now in a new age. Time has become scares commodity as we are up doing activities. The hassles of making trips to your favorite brewer every time you feel the thirst are now reduced. Thanks to these growlers. They tend to maintain your beverage as it was poured in. Flexible in use, you can use it to store other drinks too from water to your HOT coffee. Growler is a lifestyle changer. Upgrade yours by getting one of these above growlers in your next shopping experience.